Sudan, World's Last Male Northern White Rhino, Dies : Parallels Sudan lived most of his life in a zoo in the Czech Republic but was brought to a conservancy in Kenya in 2009 as part of a last-ditch effort to save his species. He died at the conservancy at age 45. Sudan, the world's last male northern white rhino, grazes at the Ol Pejeta Conservancy in Kenya in May 2017. The 45-year-old rhino's health started deteriorating in late February. 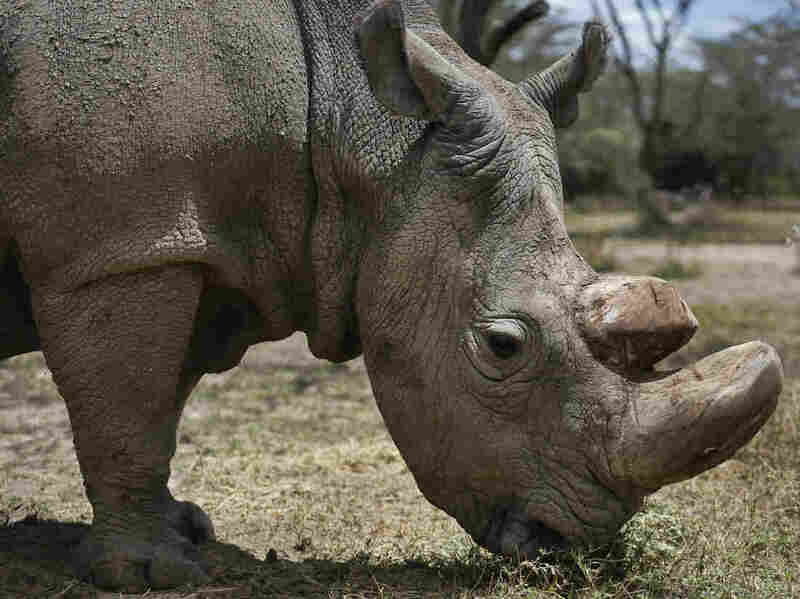 Sudan, the world's last male northern white rhinoceros, died in Kenya on Monday, leaving his species one step closer to extinction, even as a group of scientists undertake an unprecedented effort to try to keep this animal from vanishing entirely. Sudan was 45 years old, and his health had deteriorated in recent weeks after a severe leg infection. In a statement, the Ol Pejeta Conservancy said that his condition worsened and that he was no longer able to stand up, so his veterinary team decided to euthanize him. Sudan was captured in Sudan in 1975, when he was just 2 years old, and was taken to Dvůr Králové Zoo in the Czech Republic. But as that zoo fell into financial troubles and rhinos failed to breed, Sudan was relocated in 2009 to the Ol Pejeta Conservancy, in Laikipia County, Kenya, along with two northern white rhino females named Najin and Fatu. The thinking was that in a place closely resembling their homeland, they would thrive. Northern white rhinos used to be found in an area spanning Uganda, Chad, southwestern Sudan, the Central African Republic and the Democratic Republic of the Congo. Some 2,000 existed in 1960, according to the World Wildlife Fund, but war and the poaching that funded the fighting drove them to extinction in the wild. Joseph Thaida, who took care of Sudan at the conservancy since 2012, remembers him as an affectionate and gentle rhino who had his picture taken with tourists and served as the centerpiece of publicity stunts. The most famous was when Sudan got his own Tinder profile last year to bring attention to the plight of his subspecies and to direct donations to the Ol Pejeta Conservancy for research on assisted reproductive technologies for rhinos. "Whenever he hears people talking, he loves to come close, because he knows he's gonna be scratched," Thaida told NPR last year. Thaida remembered when Sudan arrived at the conservancy, watching him as he studied the southern white rhinos already there. Sudan learned how to sharpen his horn using a tree. He began to graze and wallow in mud like his genetic cousins. After years in captivity, Sudan finally learned to become a rhino at this conservancy, Thaida believed. But he and the two females never reproduced. Dr. Steve Ngulu, the veterinarian who was in charge of Sudan, said the animal's death is sad and shocking — and a testament to human failure. "But then, as far as their propagation is concerned, we are happy that at least we collected some sperm from him and the other males," Ngulu said. One of the huge hurdles facing scientists is that the two remaining female northern white rhinos cannot gestate the next generation — one is sterile and the other is not physically capable of carrying a calf to full term. "So, natural reproduction cannot take place, artificial insemination is not possible, so the only other option that we have to have a pure northern white rhino baby is to retrieve or to do something we call ovum pick-up, collect eggs from the females," Ngulu said. Those fertilized eggs would then be implanted in a southern white rhino, who would carry the calf to term. Taking eggs from a rhino, though, has never been done. If and when scientists take that risk, there is a chance that the females could perish — bringing the species to extinction.